Bayt.com and Starbucks recently partnered up to host a virtual CV Clinic and Webinar as an extension of their Opportunity Cafe initiative. With the objective to target emerging professionals and young job seekers, the goal was to provide them with an avenue to benefit from personalized counselling, CV evaluations, and job search guidance. vFairs powered this 3 day virtual campaign to connect Bayt.com HR experts with young talent in a collaborative, responsive, visually engaging, and customized virtual environment to deliver more functionality in less cost than a physical event would require. 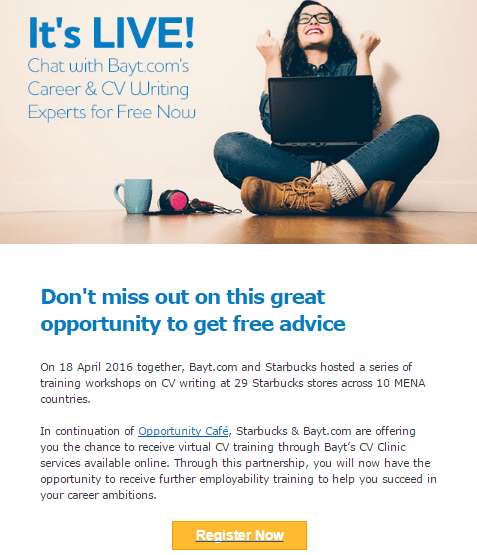 In order to communicate and educate the targeted job seekers, Starbucks and Bayt.com collaborated to host a webinar highlighting best CV writing practices and job search strategies. This was a 30 minute live session held on 31st of May, with a live chat accompanying the webinar to facilitate Q&A between participants and experts in real-time. Our informative landing page made registration and attendance absolutely seamless for the audience, with a replay option available with open access to visitors attending the event after the live stream had ended. As always, this event allowed registered users to log-in from their devices and benefit from the information in a fully mobile optimized environment. The setup for the event by the vFairs team was done to not only showcase the hosts’ branding immaculately, but also enable easy knowledge sharing. Event visitors had access to available job vacancies on Bayt.com, job seeker tools, career guidance advice, CV writing discounts, and associated content such as videos to help make the best use of the job search portal to achieve career growth. vFairs wanted to be sure that all job seekers remembered what an exciting opportunity this event was for them, and encouraged them to participate in dialogue proactively by providing a real-time chat platform. Experts from Bayt.com answered job seekers’ questions and provided CV writing expertise in both group and one-on-one chat sessions to attract and maintain audience interest. The feedback received was great with the audience expressing great satisfaction with the knowledge, value, and overall quality the event was able to deliver. An email marketing plan was designed and executed for the client to create buzz, and further support event success. The audience segments were defined and sent multiple mailers to inform, remind and update them regarding the CV Clinic and Webinar highlights. With clear call-to-action, and simplified instructions targeting increased attendee traffic, the marketing solutions provided excelled in both content and design to accomplish a surge in registrations.